"BackCheck has provided criminal record checks to Loblaw Companies Ltd. since January 2007, and have quickly established themselves as a key component of our hiring process. As one of Canada’s largest private sector employers, we require a supplier with complete scalability, to ensure our needs are met during peak hiring seasons. Services rendered are consistently delivered accurately and without delay, providing our HR managers with the ability to make timely and informed hiring decisions. We have confidence in BackCheck’s team and their client care and account management focus. BackCheck has proven to be an excellent partner – one that we rely on daily to proactively protect our colleagues, customers and assets." "BackCheck has been Scotiabank Group’s third party service provider for pre-employment screening services since 2006. By providing reference checking, and employment and educational verifications, BackCheck not only ensures consistency of approach across our organization, but also provides our Recruiters and Hiring Managers with an assurance that the applicants we hire exhibit the highest standards of integrity, competence and performance to enable us to professionally service our customers and clients. In 2009, we expanded our range of services to include Criminal Reference Checks and identity verifications. This latest initiative has improved turnaround time for hiring by a large margin, and has significantly reduced the number of applicants that are required to undergo fingerprinting. This, in turn, has greatly improved our candidate experience." Scotiabank Group, July 27, 2009. "ConocoPhillips has been a BackCheck client since 2004. When we first looked at doing background checks, we looked at the different providers in the industry, evaluating them based on technology offerings, data security, and turnaround times. BackCheck was the clear leader in each respect, and they have continued to impress us throughout the years. Our justification for implementing a background check program was based on the number of incidents we were experiencing of workplace violence and internal theft. Since choosing BackCheck, we have observed the following: A dramatic reduction in workplace violence, and a dramatic reduction in internal theft. The number of investigations we are conducting is now minimal, as our employment screening program is stopping those with a higher propensity toward violence or theft at the door. We have also observed that there is a deterrent effect in having a background checking program in place. When we first stated the program, we experienced red flags on above 20% of our applicants. Now it is down to about 6%. Potential applicants are aware that ConocoPhillips carefully screens our applicants, and those that have a criminal past or who would be likely to fabricate their resume are going someplace else. Before our background check program was in place, 1 in 5 new employees had a background we should be concerned about. Now we simply don’t hire them." "Since 2002, the BackCheck solution has been an integral component of our recruitment process at TELUS. The BackCheck solution expediently provides us with accurate and secure reference and criminal history information. Given we continuously process significant volumes of candidate files, this enables us to internally focus on selecting the best candidate for each role while also providing a meaningful recruitment experience to each candidate." "The BackCheck program has played an important role in our overall Human Resources screening and recruiting strategy as well as advancing specific Loss Prevention objectives. By utilizing BackCheck, a significant deterrent effect is built in on the front end of our hiring process thereby reducing high risk and non-productive applications and allowing managers to move more quickly with suitable candidates. BackCheck has proven responsive and understanding toward our unique requirements since starting the program in 2003." "The Boys and Girls Clubs of Calgary chose Backcheck in 2005 to provide accurate, quick and reliable background criminal checks and vulnerable sector searches on prospective employees. As our employees work with children, youth, and families, it is absolutely essential that we be able to turn this information around quickly and dependably. Backcheck has provided us with great service and their employees have been a pleasure to work with. We trust Backcheck to provide us with this service and have recommended them to other Boys and Girls Clubs across Canada." "This past season the BC Hockey Executive Committee implemented a policy requiring criminal record checks for all of our field sstaff, office staff, officials and Board of Directors. Partnering with myBackCheck.com was an obvious choice for us, since they provide simple and effective solutions for the challenges we faced in the implementation of the new policy across the province." "BackCheck has significantly reduced the wait time for our volunteers to complete their police records checks. Instead of waiting 2 to 3 weeks for results to be sent to us, I now receive them directly within 48 hours. As an organization that at times has 50 potential members in progress, the fast turnaround time is appreciated. Being able to handle the results electronically, combined with the option to complete the entire process online is also a benefit, as our organization strives to be environmentally friendly and reduce our paper usage." "Our volunteers have enthusiastically embraced myBackCheck.com as an easy, time-saving way to get their criminal record check processed. As an organization, we appreciate how easy it is to simply send someone an electronic invitation, and then get results back within 24 hours. It really does work well, and the feedback from volunteers has been incredibly positive." “It is my absolute pleasure to recommend myBackCheck.com. Our organization has required Criminal Record Checks of all staff and volunteers for a number of years due to our work with children and the public. It is very important to us that we provide a safe and welcoming atmosphere to all visitors. In the past, our staff and volunteers would have to go through a lengthy process: arriving at the police station in person, waiting in long line ups, filling out forms, waiting 2 weeks to process the check and then having to go back to the station in person again. This meant that there was often a huge lag in between the time that we interviewed staff and volunteers and gave them an offer to the time when they could actually begin work and many of our volunteers simply lost interest or were intimidated by the process. Short term contracts were impossible. A number of our volunteers are either students, seniors or new comers to Canada and all three of these groups found transportation to the police station and the process itself very challenging. Imagine being a refugee who comes from a country where the police took the rest of your family away in the night and being asked to go to a police station and give them all your personal information. For some of our staff/volunteers this process was nothing short of horrifying. Staff often would have to accompany volunteers to the station in order to help them with ESL service or to simply get transportation or offer moral support. With myBackCheck.com everything is quick and easy. We can sit down with any staff or volunteers who need assistance right here at one of our computers or they can do it from the comfort and privacy of their own home. Accepting staff and volunteers that are coming from other provinces is easy now. All you need to do is direct them to your page or send them an invitation. All you need is internet access. We don’t have to give anyone complicated directions to go anywhere else that can be intimidating. No one has to go to a police station. No one has to wait in lines or wait 2 weeks for a check. Checks are completed in 24 hours! Even those who have to have a manual ID check are quick and easy. There are lots of options to help any type of volunteer regardless of their situation. 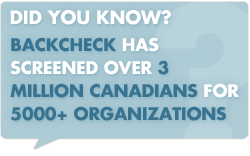 myBackCheck.com is free to use for organizations and it streamlines your screening process. The mybackcheck team works with you to develop a system that meets your organizations individual needs and they are always available to answer questions. Individuals who require a background check for more than one organization have the option of giving permission to share their check with other organizations as well. Reports are all stored online and are easy to access. “Since 2008 Scouts Canada has used myBackCheck.com to obtain Criminal Record Checks from their volunteers. Key motivators included ease of use for our offices, fast turnaround time, a consistent process of Criminal Record checking, and reminders that go to our volunteers when their checks are due for renewal every three (3) years. Scouts Canada and our volunteers have saved money by using myBackCheck.com. One of the best features is the convenience of our volunteers being able to re-use their recently completed Criminal Record Check by sharing the results online in a forgery-proof manner wherever else they may work or volunteer. In numerous instances, our volunteers required a Criminal Record Check for another organization just before or after completing one for us. When this is the case, they are able to log in to their myBackCheck.com account and share their results with additional organizations for free – without having to pay for another check. Scouts volunteers who required a Criminal Check for other volunteer organizations, their local church, school, or sports team have saved money by using myBackCheck.com.